The first INPUT program demonstrates how to sense digital inputs from the switches on PORTB of the CHRP 3 board. The second INPUTA program demonstrates how to sense digital input from the analogue devices connected to PORTA, and shows how to use logical mask operations to activate selected outputs. andwf 'logical AND W with file register' - performs a logical AND operation between each of the bits in W and the specified file register. The previous activities showed you how to make the microcontroller activate outputs. This activity demonstrates how to receive inputs from externally connected devices. The input programs also extend the concept of abstraction—the ability of a program to refer to I/O circuits using assigned variable names rather than their specific hardware addresses (eg. PORTB instead of 06h). Examining the CHRP 3 schematic, you can see that the microcontroller's Port B pins are connected to both the octal buffer that drives the LEDs (output devices), as well as to six pushbutton switches (input devices). You might wonder if it's possible for the microcontroller to use output and input devices on the same I/O port. Through careful hardware design and the use of the previously described TRIS registers, it's not just possible, but also relatively easy. Let's examine the output part hardware first. You'll notice on the schematic that the LEDs are not connected directly to PORTB. Instead, the LEDs are driven through an octal (8-wide) buffer IC. The buffer presents a high-impedance load to the microcontroller I/O pins. In other words, the buffer just senses the state of the PORTB wires, and then activates the appropriate LEDs—in effect isolating the LEDs and their current draw from the other PORTB circuitry. Next, let's look at the input circuits. The PORTB pushbuttons are connected directly to the PORTB I/O pins, albeit through a series resistor. When the port pin is set up as an input and the pushbutton is pressed, very little current flows between ground and the I/O pin, so the series resistor has a negligible effect. If the pushbutton is pressed while the port pin is outputting a high signal, the series resistor limits the current flow to ground, preventing a short circuit on the output pin. Since the hardware is set up to effectively prevent the input and output devices from affecting each other, the choice of which I/O device to use—input or output—is up to the programmer and how they set the TRISB register. PORTA of the microcontroller also includes a mix of input and output circuits, but not on the same, shared pin as occurs with PORTB. PORTA includes two phototransistor inputs (Q1 and Q2), a potentiometer, a temperature sensor, and a voltage divider input, as well as LED and beeper outputs. The switch (S1) and pull-up resistor (R1) form a series circuit, also known as a voltage divider. 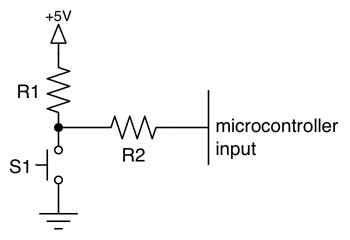 The microcontroller input is connected to the output at the mid-point of the voltage divider, and senses the electrical potential across the switch. Since any microcontroller pins configured as inputs have a high impedance, they will just sense the externally applied voltage but won't conduct any appreciable current themselves. This essentially means that the effect of the series resistor (R2) between the voltage divider and the microcontroller is negligible and can be safely ignored—R2 is installed to limit the current due to ESD (electro-static discharge), protecting the microcontroller from static charges conducted into the switch circuit by a user's fingers. Ignoring R2, the operation of the switch input circuit can be explained by the interaction of the switch and pull-up resistor, R1. You can think about how this works either by Ohm's law analysis, or by thinking about it as a voltage divider. Using Ohm's Law analysis, we know that when the switch is open, no current flows through the pull-up resistor. Since no current flows, the voltage loss across the resistor is zero, and the microcontroller input pin senses the full power supply voltage connected to the resistor—5V, or a logic 1. You could say the resistor pulled-up the switch circuit voltage to 5V. In the light-sensing circuit, above, the switch has been replaced by a phototransistor, but otherwise the circuit acts in a similar manner to the switch input. Phototransistors change their resistance in response to light—high resistance in dim light, and low resistance in bright light. In dark conditions, the phototransistor exhibits higher resistance than the pull-up resistor, causing a high input voltage at the microcontroller's port pin. If the input voltage is high enough, the microcontroller will sense it as a logic 1. In bright conditions, the phototransistor's resistance drops, reducing the voltage at the mid-point of the voltage divider. Again, if the divider voltage is low enough, the microcontroller will sense it as a logic 0. Because of the analogue characteristics of the phototransistor (as opposed to the binary action of a switch), and the voltage threshold levels of the microcontroller's input circuits, small changes in brightness won't be enough to change the state of the input. The potentiometer circuit behaves in an almost identical way to the phototransistor circuit, with the difference that it responds to rotational position instead of light. The wiper attached to the shaft of the potentiometer divides its internal resistor into two parts. Turning the potentiometer's wiper changes the ratio of the two resistor halves. The voltage at the wiper will be proportional to the ratio of the resistors. If the voltage is below a specific threshold, the microcontroller senses a logic 0. Above a threshold, and the microcontrolle senses a logic 1. The voltage divider used as a voltage sensor behaves the same way, but uses a set of fixed resistors so that its output only varies as the input varies. The voltage divider has been pre-set to produce a maximum 5V output at an input voltage of 25.5V, corresponding to 0.1V per bit of accuracy. Because of these precise steps, the voltage sensor is better suited to analogue measurement than digital. The above PORTA input circuits, except the temperature sensor, all include a pull-up resistor (a resistor connected to the power supply potential) to enable their operation. Referring back to the CHRP 3 schematic, you'll notice there are no pull-up resistors connected to the PORT B switches. Instead, this PIC microcontroller includes internal, software-controlled pull-up resistors for all of the PORT B input/output pins. These pull-ups are enabled in the initPorts subroutine through the OPTION_REG register, and affect only the PORT B pins set to be inputs. Using software-controlled pull-up resistors provides additional hardware flexibility by allowing PORT B to be used as both an input and output port, without having permanently attached pull-up resistors to interfere with the port signals. On the schematic, you will notice that there are 2.2k&ohm;resistors connected in series with the PORTB switches. These are not pull-up resistors, but are instead series current-limiting resistors necessary because the PORT B switches are connected to ground. To understand why, imagine what would happen if one of the PORTB wires was outputting a high signal and its pushbutton was pressed. This would cause the signal to be shorted to ground. To prevent this, the series current-limiting resistors provide enough of a load that short circuits are prevented. The entire INPUT.ASM program is shown below. INPUT reads the state of two of the CHRP pushbuttons and outputs a unique pattern for each button on the LEDs. Start a new project in MPLAB, copy the INPUT.ASM code into the project, and build the program. ;Description:	Demonstrates switch input on PORTB of the CHRP 3.0. The Input program begins by using the equate directive to assign bit addresses to the S2 and S3 labels. Equate statements enable us to refer to the bits by name, like this 'btfsc PORTB,S2', instead of 'btfsc PORTB,0', helping to improve the readability of our assembly code programs (especially if logical and useful label names are used). In addition to naming bits, equate directives can also assign a name, or label, to constants, register addresses, and expressions. At build time, the assembler simply substitutes the equivalent value or expression for the equated label. Using equ directives provides some important benefits to assembly code programmers by abstracting the hardware. If the circuit design changes (perhaps in a future revision of the circuit board), the program code can be updated by simply changing the label reference once at the top of the program, rather than at every location in which the reference appears in the program. In addition, the label names have more meaning than bit numbers because they relate to the circuit board—you can look at the board and see where S2 is, but you have to refer to the schematic to find out that it's really PORTB,0. And, as humans, we tend to prefer names over numbers. This web page is hosted at www.siriusmicro.com, and also at an equivalent numeric IP address such as 67.220.228.5, but I'll bet you didn't type in the IP address to get to here in your browser! Following the equates, the initialize code in the input program is almost exactly like that in the previous output programs. In addition to controlling the timer, the OPTION_REG register also enables or disables the internal pull-up resistors. The pull-ups are enabled as a group for all Port B pins, but only affect those pins set to be inputs in TRISB. In the Input program, PORTB bits 0 and 1 have been set as inputs by setting their corresponding TRISB bits. The checkS2 and checkS3 subroutines both use btfsc instructions to check the button states. If no buttons are pressed, the associated port pins will be high, causing the code to go to the other check subroutine. If one of the buttons is pressed, the corresponding port pin will be low, and the bit test instruction will cause the processor to skip over the goto instruction and set the LEDs with a unique pattern for that button. A variation of the input program, INPUTA.ASM, is shown below. INPUTA uses Port A for input, and requires the phototransistors to be installed in the CHRP board. When each phototransistor senses light, four LEDs corresponding to that phototransistor are lit. Start a new project in MPLAB, copy the INPUTA.ASM code into the project, and build the program. ;Description:	Demonstrates phototransistor input on PORTA of the CHRP 3.0. As in the Input program, equate statements are used to assign bit addresses to phototransistors Q1 and Q2, and LED12, the phototransistor light source. Notice that the actual phototransistor bit positions are the same as they were for pushbuttons S2 and S3 in the Input program, but in the InputA program these bits refer to PORT A bit addresses rather than PORT B bit addresses. MPLAB doesn't inherently know which port you are referring to from the equate—it merely substitutes the equated bit address into the btfsc PORTA instructions appearing later. Similar to the Input program, the checkQ1 and checkQ2 subroutines each check the state of their associated phototransistors to determine which LEDs should be illuminated. The similarity ends at the iorwf instruction. Unlike Input, in which pressing one button lights specific LEDs until the other button is pressed, the InputA program will show the state of both inputs simultaneously, by using logical operations to control the PORTB bits. In InputA, half of the LEDs will illuminate when one of the phototransistors sees light. To avoid overwriting the state of the other half of the LEDs (as would happen using a movwf instruction), we use logical gate instructions to modify only the four bits corresponding half of the PORTB LEDs. We do this by using an AND operation to clear all bits and turn off the LEDs, and an OR operation to turn on the LEDs. To see how this works, take a look at the following logic gate truth tables. Imagine that the A input is under our control (through the program), and the B input is the value already in the PORTB RAM register. Divide each truth table into a top half (in which A is 0), and a bottom half (in which A is 1). If you compare the AND gate's X output while A is 0, and again while A is 1, you should see the pattern that the AND gate provides. When A=0, X=0, but when A=1, X=B. In and AND operation, we can use the A input to either clear the register (A=0), or to leave the register value unchanged (A=1). Any bits in the register ORed with a 0 will remain unchanged. Those bits ORed with a 1 will be set. Any bits in the register ANDed with a 1 will remain unchanged. Those bits ANDed with a 0 will be cleared. By using logical operations, such as AND and OR, we can change as many (or as few) bits in a register as we need to, without modifying any of the other bits that need to remain unchanged. Explain the purpose of the equate statements in these programs, as well as two advantages of using equates instead of statically-coded references. Explain the difference between the btfsc and btfss instructions. How many clock cycles does it take to execute a goto instruction? Why is this different from other instructions, like movlw, or bsf? When a PORT B switch is pressed, will the microcontroller input be low, or high? Why? Assemble the Input program. What do you think will happen when both buttons are pressed? Verify this with the simulator or on your CHRP circuit. Modify the Input program to be a push-on, push-off light switch. Use S2 to turn one or more lights on, and S3 to turn the same lights off. Make a copy of the program in which the three switches S2, S3, and S4 each illuminate a different light pattern. Modify the InputA program to use the CHRP board's potentiometer as its input, and measure the input threshold voltages—the potential at which the input pin switches from 0 to 1, and back from 1 to 0 using a multimeter.